Last Week, Newman Plumbing had an enquiry from a homeowner in Canterbury who had a potential very costly problem with blocked sewer drains. After being advised to fix the problem would require relining of the sewer pipes costing many 1000s of dollars the Homeowner decided to get a second opinion from Newman Plumbing Pty Ltd as they had heard of the Sanofoam Vaporooter System being used by Newman Plumbing. After clearing the blockage Newman Plumbing used the Diagnostic Drain Camera to inspect the pipes and were able to show the homeowner via a DVD that on this occasion the pipes were suitable for the Sanofoam Vaporooter System which was far more economical for sewer drain control and also included a 12 month guarantee. An annual maintenance application of the Sanofoam Vaporooter System proved to be far more economical than relining of the pipes and once again we had a very happy customer. The Licensed Applicator from Newman Plumbing will advise via the DVD the condition of the older earthenware pipes and if any pipes have deteriorated to the stage where relining or replacement is required. These outcomes are very expensive which makes the Sanofoam Vaporooter System a much better Solution. 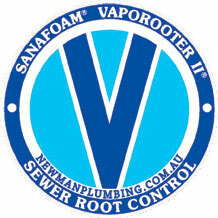 Using the Sanofoam Vaporooter System on your Sewer Drains will ensure the Pipes do not deteriorate from Tree Roots to a stage where relining or replacement is required. With the ongoing maintenance program a continued Guarantee will apply and also prove to be cost effective. Call Newman Plumbing on 98993442.